The Flakpanzer IV Wirbelwind is a Rank III German self-propelled anti-aircraft gun with a battle rating of 3.7 (AB/RB/SB). It was introduced in Update 1.43. The Flakpanzer IV Wirbelwind is a anti-aircraft platform on a Panzer IV chassis. Armed with quad 20mm FlaK38 cannons, this machine will absolutely obliterate any enemy plane that's unfortunate enough to cross paths with it. Due to the high fire rate, this machine effectively spews out a river of high exlposives. Any airplane unfortunate enough to even touch that stream will at least burst into flames, if not more severe damage. However, they are incredibly easy to spot because of the tracers. While an individual 20mm shell does not do much damage, it is very hard when using the Wirbelwind to hit an aircraft with only one shell. The sheer number of shells will overwhelm the aircraft, and act like a laser, cutting off pieces and burning others. Suspension wheels are 15 mm thick and tracks are 20 mm thick. Some track links are placed on the front glacis, adding 15 mm armour at their area. (High Explosive Fragmentation Incendiary tracer) shell Versus planes and open combat compartment vehicles. Aircraft will usually take three to six hits. Heavy armoured attackers and bombers may require more though. (High Velocity Armour Piercing tracer - Armour Piercing Incendiary tracer) shell Best penetrating shell of this vehicle. However, the damage effects are very poor. In close combat snipe for modules and crewmember for increased survival rate. Nothing is more annoying than emptying a clip and then to get destroyed in the reload because the enemy gunner survived. Against angled armoured it is not very effective like any other ACPR shell, this is offset by the very high base penetration though. Ammo racks for the Wirbelwind. Being the first anti-aircraft of a modified Panzer IV, it is superior than the previous vehicle, the 3.7-cm Flak 36 auf Selbstfahrlafette Sd.Kfz. 6/2 in many areas and has little to none disadvantages. One notable would be the lack of penetration of API-T rounds compared to the prior 3,7 cm cannon. 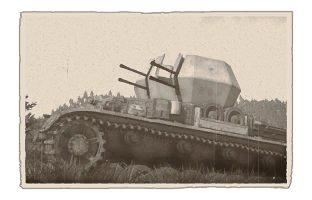 It is recommended to stay away from areas of combat as your quad 20's will do practically nothing against the front plates of heavier armoured enemies at its rank, against which its only defense is to blind enemy vehicles with a barrage of fire and hope allies will neutralize the threat. However, firing a stream of HVAP-T rounds into almost any enemy's side plates will often lead to a very fast elimination. 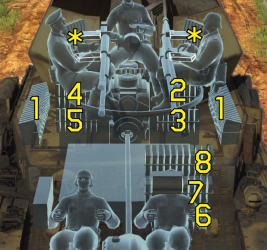 Since it can be hard to always get such a favourable engagement, when using a Wirbelwind aggressively, the player should either use friendly tanks for cover, only on occasion peeking from behind them, or flank wide and make effective use of cover and concealment — popping out for prized targets such as the lightly armoured M18 Hellcat. Pay attention for enemy streams of tracers, as these can signal an easy target in the shape of a lightly armoured anti-air vehicle. To use this machine at its full anti-air effectiveness, it is recommended to stay near friendly vehicles for protection and stay vigilant for enemy aircraft, but PzGr 40 can be used on unsuspecting enemies. Do mind that engaging aircraft is not only where this vehicle shines in the offense, but a crucial part of its defense, as its open top means an enemy fighter can easily turn its fighting compartment into a soup can with mere machine gun fire. Even though the PzGr 40 can penetrate many of the medium tanks it faces, the Wirbelwind is still far from being the optimal choice for anti-tank engagements — its penetration decreases drastically at range and it's not enough to deal with more heavily armoured vehicles. The Wirbelwind's armour is only enough to reduce damage done by airplanes, which makes battling a tank very dangerous. The armour surrounding the turret can provide a small amount of protection against plane machine guns, but the amount of armour on its turret is still low and it has an open top so it's best to destroy the attacking plane quickly or move out of the way. Use roads less traveled to remain hidden. Two Wirbelwinds about 30m apart prove a daunting combination to enemy aircraft as their crossed streams maximize their ability to hit and it is very hard to neutralise both in one go, besides doubling their spotting ability — when one sees the other firing, he or she will be quick to acquire the same target and proceed to severely worsen the aeroplane's day. For this reason, as a matter of etiquette, do not fire into the air if you do not see anyone, so as not to mislead your teammates. Tier 2: FPE (fire extinguisher) -> plus something of desire Adjustment of fire is not recommended with 1800rpm. Spray a minefield! Everything else can be researched at leisure. HVAP and API mix can penetrate most tanks at its BR frontally in close quarters, or even some Rank IV vehicles if aimed at weak points. High driving speed able to move from cover to cover with little to no problem. Development of self-propelled anti-aircraft guns that could keep up with the Panzer formations were not taken into consideration in the early years of World War II due to the Luftwaffe's superiority over the air, but gradual losses in the Luftwaffe and inability to support their flights gave the Allies the upper hand in the air, granting them air superiority. The growing air power of the Allies forced the Germans to develop methods to protect their tank formations from strafing from Allied aircraft, one early design to protect the front line tanks was the Flakpanzer IV Mobelwagen, an interim design as Flakpanzer designs underwent development. SS-Hauptsturmführer Karl Wilhelm Krause of the 12th SS Panzer Division came up with the concept of the Flakpanzer IV Wirbelwind in the summer of 1944. The commander of the 12th SS Panzer Regiment, SS-Obersturmbannführer Max Wünsche, received this and presented it to Hitler, to which he approved for its development. The design called for use of the proven Panzer IV design. 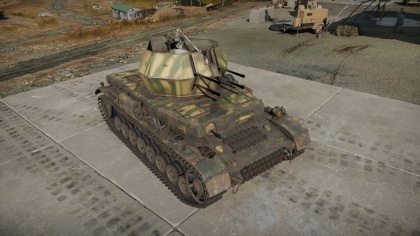 The Wirbelwind uses the Panzer IV hull, but the original Panzer IV turret was removed and replaced with a open-topped nine-sided turret that mounted the anti-aircraft armament. The anti-aircraft armament chosen for the vehicle was a quadruple mounted 2 cm FlaK 38. Though a closed-top turret design was desired, the amount of gasses given out by the gun made this impossible for the crew. The production of the Wirbelwind commenced at the Ostbau Werke at Sagan, Silesia. Between 87 to 105 Wirbelwinds were manufactured from May to November 1944, with the discrepancies due to differences in the Wehrmacht service records and Ostbau Werke's production records. The troops nicknamed the Wirbelwind the "Keksdose" (Biscuit Tin) due to its unique turret shape. The Wirbelwind were equipped with Panzer formations to protect them against low-flying aircraft. During the Battle of Normandy in 1944, flak units in the 12th SS Panzer Division was credited with shooting down 45 allied planes. However, there weren't enough to go around in the front-lines so many Panzer formations were left vulnerable to enemy aircraft due to lack of availability of the Flakpanzers. Not only did their small numbers made their effect on the front minimal, the 20 mm cannon was determined to insufficient against the more armoured aircraft that the Allies are fielding. Thus, the design was changed to not use the quadruple 2 cm Flak 38, but instead the 3.7 cm FlaK 43 in the new designation Flakpanzer IV Ostwind. Aside from that the Wirbelwind also served as a ground support role, which it proved very well at with its rapid firing 20 mm cannons. It was determined that the Flakpanzer IV in the Wirbelwind and Ostwind configurations were to be replaced by the Kugelblitz by early 1945, in an attempt to yet again increase the firepower of the anti-aircraft guns. But this never happened due to the war ending before the Kugelblitz could be deployed. Skins and camouflages for the Wirbelwind. This page was last edited on 12 March 2019, at 18:57.